Opinion on spoken discs is pretty much split among soul fans. Some like the close relationship between a gospel sermon and a secular rap, others think that without a sung narrative the whole disc is debased. Joe Tex often used spoken passages to really wonderful effect and Millie Jackson took the art to a completely different level of course. I’m in both camps on this one – done properly and with care a spoken passage can really add a new dimension to a song – but often it can be just a “filler” passage. 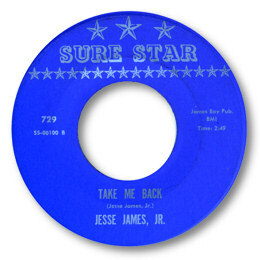 This rarity Take Me Back by Jesse James Jr. seems to me to be a fine example of how this ought to be done. The message and the delivery over a classically formed deep soul background are both emotionally compelling and very well judged. My only complaint about this disc is that it stops about 2 minutes too early as we only hear him singing for about 20 seconds right at the end of the 45 and it’s clear that the guy had a really good voice. No relation to the more famous Jessie James I don’t think.